The HTC 5G Hub is a tablet-shaped device with a Snapdragon 855 processor, intended to serve primarily as a 5G hotspot. Up to 20 devices can connect at once, and there's an Ethernet port on the back for wired internet connections. The Hub also runs Android 9 Pie, but it's unclear if the Play Store is available. HTC claims the 5G Hub is "at the forefront of cloud-based virtual reality (VR) technology, because "users will be able to stream VR content from the cloud to a VIVE Focus headset via the HTC 5G Hub." The Vive Focus is a self-contained headset with Wi-Fi support, so there (presumably) doesn't need to be any special functionality for the Focus to connect to the hub. By HTC's logic, the 5G Hub will also be at the forefront of cloud-based food technology, because you could connect a smart refrigerator to it. In the United States, the 5G Hub will be exclusively sold by Sprint. In other countries, HTC is partnering with Telstra, Three UK, Deutsche Telekom (Germany), Sunrise (Switzerland), and Elisa (Finland). It will be available sometime in Q2 2019. 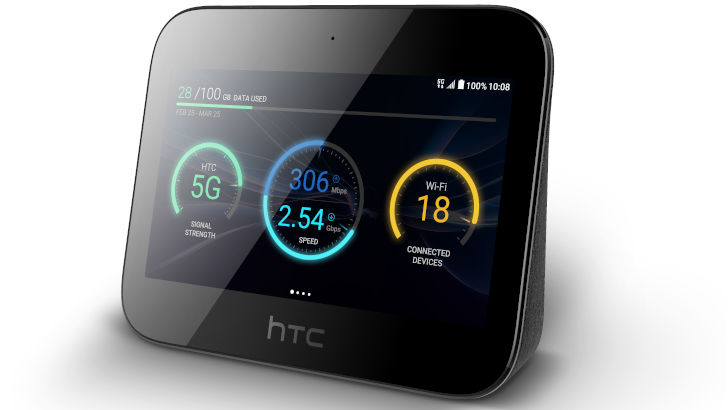 BARCELONA – February 25, 2019 – Today, HTC® unveiled the new HTC 5G Hub, a first-of-its-kind dedicated 5G mobile smart hub that commands the rapid speeds of the future. Designed for ease of use in both home and office environments, this versatile device enables smooth 4K video streaming, low-latency gaming, and 5G mobile hotspot features for up to 20 users. Carriers across the globe will offer the HTC 5G Hub—including Sprint, Telstra, and recently added European carriers: Three UK, Deutsche Telekom (Germany), Sunrise (Switzerland), and Elisa (Finland). The HTC 5G Hub allows customers to use 5G on multiple devices while on the go, at work, or at home for fast connectivity, content sharing, entertainment and more. A 5-inch HD touchscreen allows for ease of use and high-quality visuals, and long-lasting power makes for a travel companion that harnesses 5G speeds dramatically faster than 4G LTE networks. This product is also at the forefront of cloud-based virtual reality (VR) technology. In the future, users will be able to stream VR content from the cloud to a VIVE Focus headset via the HTC 5G Hub—no PC or unnecessary cables required—to enjoy a mobile, high-end VR experience in real time. As a home media center, the HTC 5G Hub uses next-gen 5G speeds to stream 4K videos to a second screen and deliver crisp, clear content. It can also replace a Wi-Fi router and remove unnecessary cables with an easy to use plug-and-play setup. Intuitive voice command and remote-control features make it quick and easy to manage entertainment and productivity needs. For gaming, ultra-low-latency, 60fps, and 4K resolution (on compatible screens), the HTC 5G Hub is powered by the Qualcomm® Snapdragon™ 855 Mobile Platform with the Snapdragon X50 5G Modem and antenna modules with integrated RF transceiver, RF front-end (RFFE) and antenna elements. Along with Android™ 9 Pie, this allows for unprecedented download speeds and power for native Android and PC games supported on the large screen. The HTC 5G Hub is also designed for high-speed mobility use with the next-generation business environment in mind. This product supports the powerful Wi-Fi capabilities offered on the Snapdragon 855 Platform by including the Qualcomm® 60GHz Wi-Fi chipset (based on the 802.11ay specification) for multi-gigabit speeds and wire equivalent latencies, as well as the Qualcomm® 2x2 Wi-Fi 6-ready chipset for next generation capacity, efficiency, and performance at range. A 7,660 mAh battery makes the HTC 5G Hub ready to support a wide range of on-the-go duties. Businesses can connect up to 20 devices safely and securely on a high-speed encrypted network or configure for a corporate VPN. As businesses grow, the 5G network is also easily scalable via built-in Gigabit ethernet port. The HTC 5G Hub will be available through select retailers beginning in Q2 of 2019. Please visit the HTC 5G Hub website for more information. HTC will be demoing the HTC 5G Hub this week at Mobile World Congress in Barcelona, Spain. HTC will also showcase the latest innovations from HTC VIVE—including Vive Focus Plus, the newest standalone headset, and the new Vive Pro Eye. The company will be spotlighting ground-breaking partner experiences and their own multi-user collaboration tool, Vive Sync.